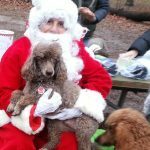 This year, once again, Santa Paws will visit the park, bringing a treat to each good dog and cocoa and a cupcake for their people! He will pose for a photo if you want a picture of your dog with Santa Paws. In keeping with the holiday spirit, this annual fundraiser benefits local dogs and other pets that are less fortunate than our own dogs. All donations will go to the Pennsylvania S.P.C.A. Cash or checks are accepted — If you wish to donate via check, make your check payable to P.S.P.C.A.